Hello fellows, this is the first post in the new Developer Blog by Ronoaldo. This blog post is also the first of a series of reviews on Cloud IDEs. They give you the power of scaling your development environment as the same way you scale your applications. Also, it is the same workspace on all your devices: no need to setup your workspace over and over again. A cloud development environment allow applications to be entirely coded, tested, built and deployed in the cloud. The concept of a Cloud IDE is gettig more and more attention, and this is the first post of a series of reviews about some of the tools I've tried. I'll start the series with Nitrous.IO. It has a clean design, extremelly fast responsive UI, comes bundled with all tools to jump in and start coding, allows you to run servers and other tools on your box and test you app live from there. It has all features that are really usefull to replace your local environment, and new features are comming. If you're used to run Eclipse locally, and try Nitrous.IO for Java, you'll probably miss a few of buttons, short cuts, menu entries and so one. I found that the key strengh that Nitrous has is that all things simply work. Period. I've tried other IDEs that has some fancy buttons, but they don't work for real worls projects. This gives you the felling that programming in the cloud will not work at all. Nitrous, on the other hand, has just the small subset of tools that you need to develop online, and all features there simply work. I'm a big fan of running stuff on the terminal: it is simple to remember, easy to automate, and it gives you a full power of doing, well, anything! 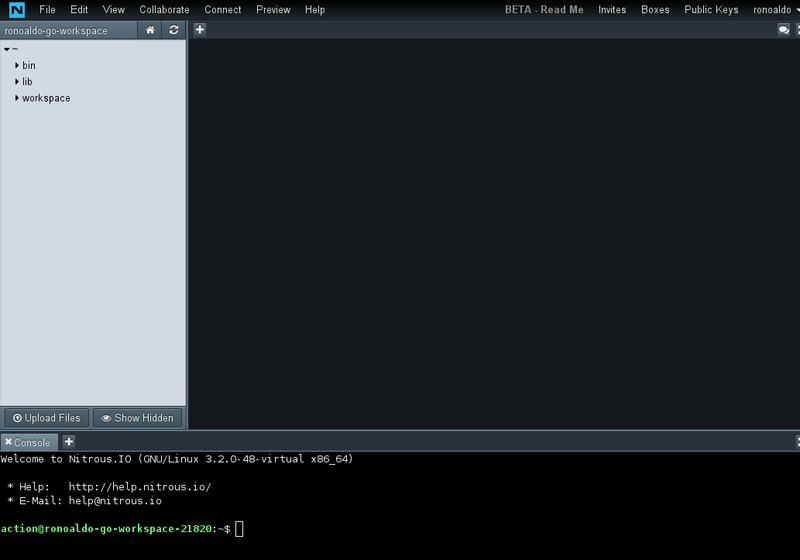 The terminal emulator of the Nitrous IDE is one of the most amazing I've used. It allows you to fire up Vim and have the feelling that you're on your local computer. It responds so fast that you don't even realize that evey character you type goes over the internet. It is even faster than most SSH sessions I've being running over some cloud providers, with not freezing of the UI. The IDE also has a clean and usefull code editor. The editor is very simple, has syntax highlight but no code completion. It comes with a dark theme, which helps you keep focus on your code. It also handles tabs/soft-tabs very nicely. The possibility to invite people for your workspace is also cool, and works fine. You can edit the same file, doing a "pair programming session", with a remote co-worker. Wen you finish, you can simply remove access for your workspace. You have full control, unlike other tools where you can't remove someone you've added. Another key strengh of Nitrous is flexibility. The concept of "build your own plan" is really cool. My opinion is that this is something that all other players on the market didn't realized yet: every developer and project has different needs. There is no plan that will fits all, and bringing the "pay as you go" to IDE was a smart move. This opens a whole new gate of possibilities. It allows you to try out with less cost, and when you feel that the tool is ready to do the job, you just buy more NO2 and the thing runs faster or with more storage. You choose. Having choice to configure your workspace the way you need it is really important, specially if you work with different projects. But the customization don't stop there: you can download and install on your box other toosl you'll need, making your box the perfect workspace for all your projects. The Nitrous.IO environment is fun, usefull, clean and solid. All you need to build your apps! Altought the princing is still not finished, and they're still in beta, Nitrous is the tool I'll definitelly keep looking forward, and I invite you to try it out. Leave your comments bellow, and don't forget to subscribe to keep updated with the new posts of this series.